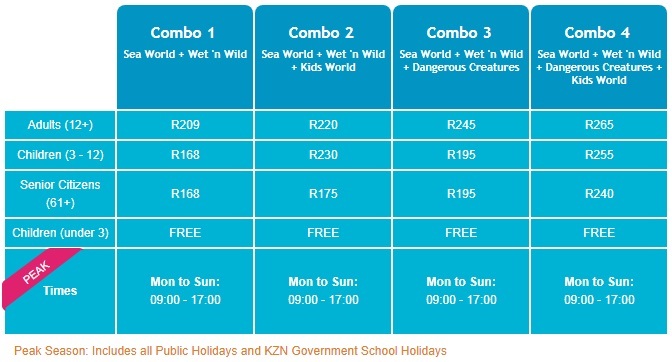 “Unlimited Fun” is the motto at uShaka Marine World, and there isn’t a more accurate and true statement to describe the fun park which is one of the most popular tourist attractions in our beautiful city of Durban. I was lucky enough to be taken on an adventure for the day, to explore the park and all that it has to offer and now, I get to share all that uShaka has to offer… with YOU! Upon entering the Village Walk, we found some very alluring Dangerous Creatures on exhibit for the whole family. If you are wanting to pay the exhibit a visit you can be sure to see some exciting reptilians, including but not limited to the Black Throated Monitors (A.k.a The Dragons), Dart Frogs, Tarantulas and the venomous False Water Cobra! If you enjoy creepy crawlies, then this exhibit is for you and best thing, they are open ALL YEAR ROUND! Set inside an old ship wreck on its very own island, Sea World is home to a variety of beautiful and interesting underwater creatures. It is here you can go to a live Dolphin, Penguin / Seal show (daily)…the shows are fun and aimed at educating the public and as always, a strong message of conservation is conveyed in a way that is understood by all ages. The beautifully manicured gardens and pathways lead you around different pools and areas to explore. If you have a love of dolphins or just curious how sharks interact, then you definitely have to make a plan to visit and try one of the Sea Animal Encounters – surely a once in a lifetime experience – from the Xpanda Shark Dive (for the BRAVER humans beings out there) to a Dolphin Encounter, live feeds, snorkeling and the Ocean Walker – you may just need more than one day here to do everything your heart desires! For show times, click here. If you are visiting uShaka Marine World for the first time, or are a regular, you can be assured you will have a good time, go home happy and have learnt something new. No matter which experience you choose you can be sure it will be educational, interactive and fun. Current combo ticket pricing (below) is valid until the 14th Jan 2018, so get in on the deals before they end!